Please note: this guide only applies to webpages which use the WPBakery Page Builder. Firstly, if you have a large image, resize it on your computer, before it’s uploaded to your website. Large image files (e.g. straight from a digital camera) may be several megabytes in size and can increase the loading time of your webpages for visitors. If necessary, setup rows and columns on your page, so you can create your desired page layout. Click on the + icon to add a new element. Add the “Single Image” block. 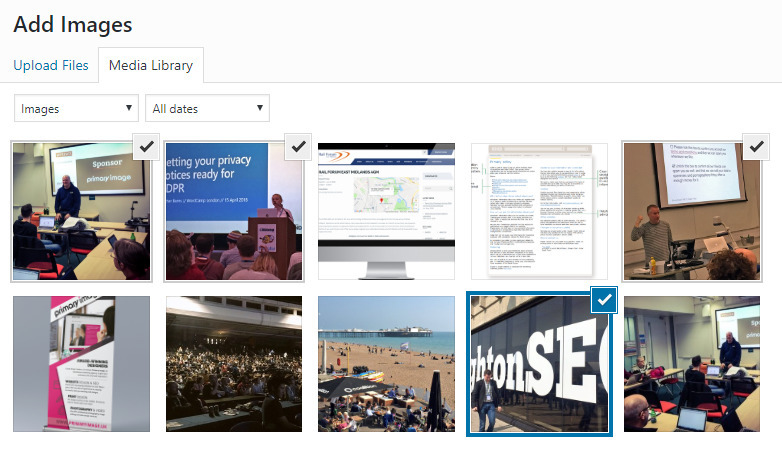 Ensure the “Upload Files” tab is displayed, then either drag and drop the image file from your computer into the screen, or click the “Select Files” button. Your image will upload within a few seconds. Alternatively, if you want to use an image file that’s already been uploaded to your website in the past, click on “Media Library” instead. 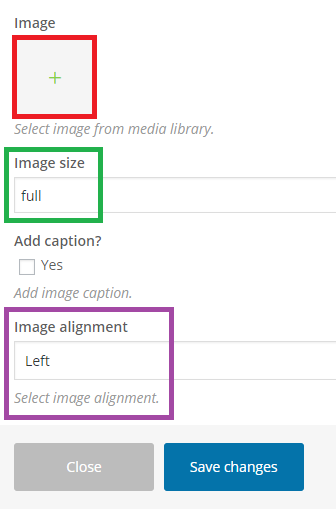 Generally using the “full” image size should be fine (indicated above in green), as long as your image file is suitable for web use. Or you can type “medium” into here to display your image smaller. Choose your image alignment (highlighted above in purple). In most cases, it looks best to centrally-align your pictures, rather than left or right. 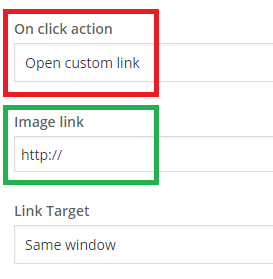 Add a URL into the “Image link” box (indicated in green above). This can be a file link, such as a link to a PDF or Word file. Hover your mouse over the block. You’ll then see the editing screen. 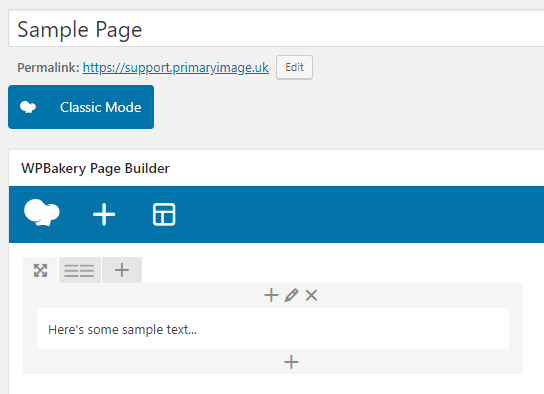 Within WPBakery Page Builder, if you’re using text blocks, you can insert images straight into these paragraphs, rather than using a separate image block. This may be ok for simple layouts. 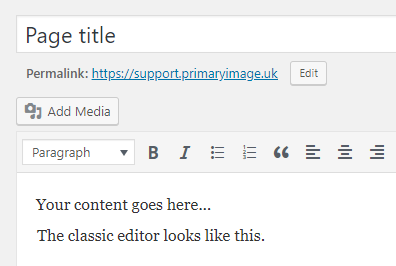 To do this, follow our separate guide on using the “classic editor”. 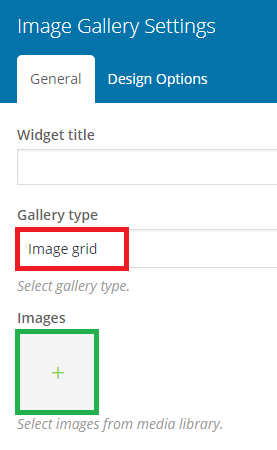 Next, choose your gallery images by clicking on the area indicated in green above. When uploading lots of images, please be patient as this may take a while to upload and process. 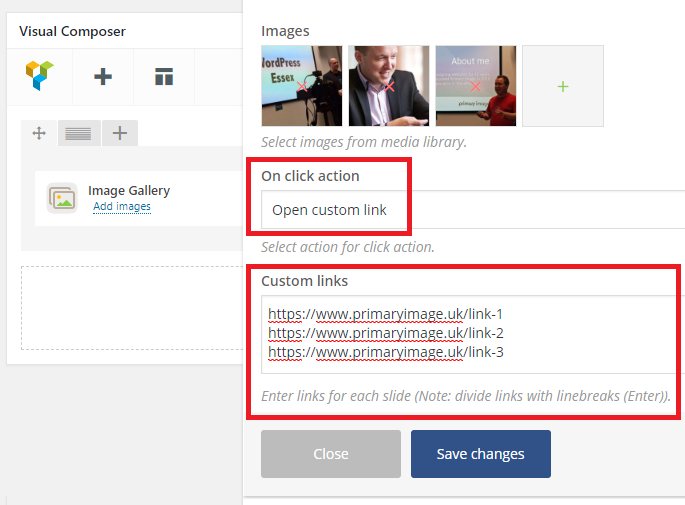 Alternatively, if you want to use image files that have already been uploaded to your website in the past, click on “Media Library” instead. Next, click on the “Add Images” button. Click on the “Save changes” button at the bottom of the dialog.